Move to the beat with Creative Hitz™ MA2300, a lightweight headset designed with your comfort in mind. Easily switch between your calls and music playback with the one-button in-line microphone integrated along the flat tangle-free cable. Move to the beat with Creative Hitz™ MA2300, a lightweight headset designed with your comfort in mind. Easily switch between your calls and music playback with the one-button in-line microphone integrated along the flat tangle-free cable. Combining powerful driver technology and striking colors, the Creative Hitz™ MA2300 is your ideal audio companion. 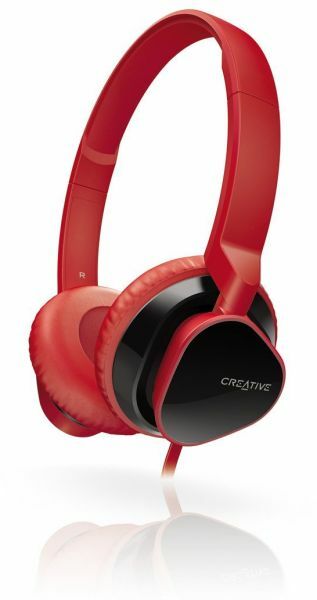 Move to the beat with Creative Hitz™ MA2300, a lightweight headset designed with your comfort in mind. Easily switch between your calls and music playback with the one-button in-line microphone integrated along the flat tangle-free cable. Combining powerful driver technology and striking colors, the Creative Hitz MA2300 is your ideal audio companion. The lightweight frame with supple earcup and headband padding offers unbeatable comfort even for extended wear. Its on-ear design delivers optimal sound isolation for an immersive listening experience. The earcups of the headset fold flat for convenient and compact storage, making it convenient for traveling. Meticulously tuned 30mm Neodymium drivers offer a balanced performance with your latest tracks while preserving clear voice calls. You're ensured of getting the best sound for any usage scenario.